I previously told you about Pieceable Retreat. I finished my quilt top. YEAH!! Here is a picture. I added an extra row and and extra boarder. It looks good. Now to quilt it. 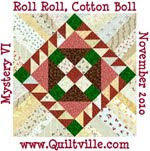 Will have to wait until I get customers quilts caught up. Probably after Christmas. I may have to make this again. 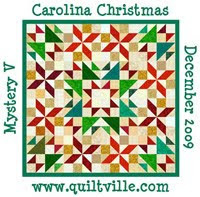 Thanks to Nancy Miller for the wonder Mystery Quilt class. Congrats on getting the top done...I like the red in the quilt. What pattern is this? I love, love, love it!! 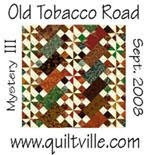 Trish, the quilt is a mystery quilt class and the teacher designed and owns it. I do know she designed it on EQ6. Wow Vicki I had no idea how neat the quilt you made at retreat would look. I think I would have liked to take that class after all.